He keeps running into walls. He forgets that he has to hold his head up and ends up toppling over as the cone drags on the carpet. 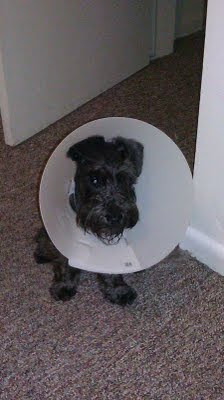 He tries scratching his ear but scratches the cone instead. He keeps growling with frustration. It's the funniest/saddest thing I've ever seen. And now news from the baby growing front: Baby loves cold pizza and everlasting gobstoppers. Baby hates vegetables and chicken. I love sleeping ten hours a night. But, ps. Andrew peed his pants too. The good news is that we're moving to Colorado, not Georgia. So we'll definitely see you soon.